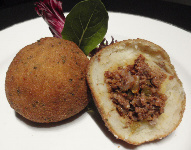 Cuban style stuffed potatoes with cooked and seasoned ground beef inside. Ripe and sweet fried plantains. Corn tortilla chips with homemade hot salsa and guacamole. Served with pinto beans, corn tortilla chips, cheese, sour cream, guacamole and pico de gallo. Grilled flour tortilla with melted cheese inside. Served with sour cream, guacamole and pico de gallo on the side. 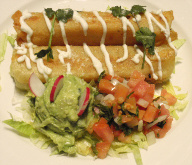 Rolled up deep fried Corn tortilla stuffed with Cheese; or your choice of Chicken, Beef or Pork. 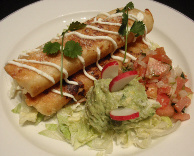 Rolled up deep fried Flour tortilla stuffed with Cheese; or your choice of Chicken, Beef or Pork. Add $3.95 for Chicken or Pork. 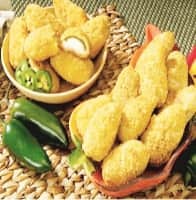 Fried turnover pastry filled with choice of chicken or ground beef. 8 Pieces of Jalapeño Chilis stuffed with cream cheese and deep fried in batter. Served with ranch dressing on side. 5 Pieces of Crisp deep fried wings coated with hot sauce or BBQ sauce. Served with celery and carrot sticks and ranch dressing on the side. 5 Pieces of Deep fried breaded chicken breast served with french fries and Honey Mustard on the side. 8 Pieces of Deep fried breaded Zucchini served with marinara sauce on the side. 5 Pieces of Deep fried breaded mozzarella cheese sticks served with marinara sauce on the side. 5 Pieces of Flavorful grilled chicken on skewers served with sweet chile sauce on the side. 8 Pieces of Homemade grilled dumplings Filled with ground pork. Served with Dipping sauce on the side.